Homemade Halloween costumes are the best! This year Halloween coincided nicely with Bea's current movie obsession - Peter Pan. (I'm not complaining!) 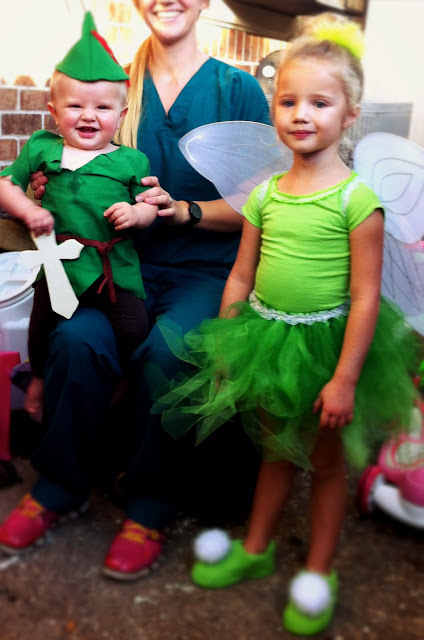 Here is what I came up with for a quick and easy DIY Tinkerbell and Peter Pan Halloween costume. Green felt for the hat - two layers, cut out a triangle hat shape and go for it. Sew the triangle, and then finish the edges after trying it on to make sure it's the right shape. I cut a little hole in the side of the hat to stick the red feather into. Jack kept his hat on for 10 seconds at a time. : ) Extra feathers come in handy. Simple, green cotton fabric for the shirt - I folded the fabric in half, laid one of his bigger shirts down on top of it so that the shoulders lined up with the fold in the fabric, and traced a line around the shirt. Leave it long, like dress length. I then cut the fabric with about 1.5-2" extra around the border. Cut a hole for the head using the shirt you used to trace as a template. Then cut a deep "V" neck. Sew around the cut edges, leaving the head, arm and torso holes open, of course. Turn inside out and cut "V"s out of the edges the sleeves and torso. Take the top points of the "V"neck and tack them down with a few stitches to create little lapels. If the head hole isn't big enough to go over your little guys head (my baby has a huge head! ), then just make the "V" deeper and you can always use leather string to lace it back up, if necessary. Little girl leggings - Men in tights are the cutest. I had to get brown because green leggings are hard to find. Plain, lime green T-shirt - The one I used was over-sized (like a youth L), and I cut it to make it fit. First I cut off the neck and sleeves so that those finished edges were gone. Then I laid down one of her dresses/shirts on top of the T-shirt and traced around it, and cut around the edges with 1.5-2" extra around the border. I re-sewed the edges and finished the sleeves with a simple stitch around the perimeter. Instead of finishing the neck in the same way, I used an elastic ribbon and sewed it on top of the edge of the neck. I kept the shirt long, like dress length, and cut out a "V" pattern on the bottom edge. This gave a little extra coverage with the sheer tutu, but she wore some little shorts too. Green tulle and elastic for the tutu - I used two different shades - a lime green and a kelly green. For the most part, I used this tutorial to make the tutu. Basically, I just sewed a waistband of elastic (I used 1" wide), cut tulle into strips of different widths and lengths, and then tied them on to the elastic band. I did longer pieces first, and then shorter pieces on top. I cut the ends so that they came to a point. To make it look more finished I sewed elastic ribbon on top of the waistband, but make sure you are happy with the fluffiness of the tutu because you can't add on after this step. Sleeves from the T-shirt and sparkly pom-poms for shoe covers - I saved the sleeves from the T-shirt and found that they went around the shoes perfectly. (This may not always pan out proportionally, so any extra fabric will do.) I put the finished edge of the sleeve around the bottom edge of an old pair of Bea's shoes. I attached the pompoms by tacking them down a few times with thread and then gluing them also. Attach the shoe covers by gluing around the bottom border and sewing or gluing around the top, as needed, for them to stay put. Fairy wings from party store with elastic ribbon for arms - The typical cheap set of fairy wings generally have terrible, oversized arms. The ones on these fell off after trying them on once. But that's ok, we replaced them with cuter, more functional ones anyway. : ) I used the same elastic ribbon I put on the waistband of the tutu. Pretty simple, just sew a circle of ribbon to the wings. I also had to make the wings less wide, so I just folded the fabric the wings were attached to, sewed it, and cut off the extra fabric. For fairy dust, I used some gold glitter spray I found in the Halloween section at Walmart. Caution: That stuff is potent and messy, but makes little fairies happy. I might try to find some 90s style body glitter gel or something instead though. And there it is, easy as that. It took me two or three nights to make them, and I think just about all of the supplies were purchased at Hobby Lobby.